Game Information: Everyone knows the beloved fairy tale of Jack and the Giant Beanstalk, and that is the story that acts as the theme for this 5 reel and 20 payline pokie. This game was created by NetEntertainment, colloquially known as NetEnt, one of the very best software providers in the industry. 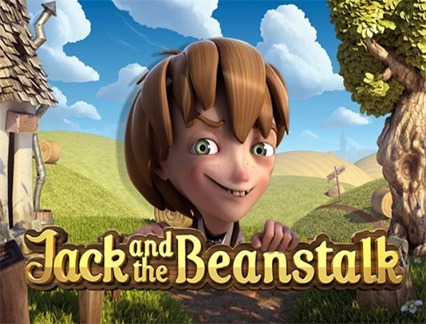 NetEnt is known for their incredible 3D graphics as well as their quirky spin on themes - both of which are absolutely apparent in Jack and the Beanstalk. This game is anything but boring. It provides a rollercoaster of emotions and takes you back to your childhood with the fairy tale theme. It is packed full of added extras such as Wilds, Scatters, free Spins and even AutoPlay. Although this game follows a standard setup, there are still more than enough customisable features to make your game meet your own, personal needs. You have options when it comes to how much you’d like to bet and whether you’d like to speed up your game using AutoPlay. Scatter: The Scatter symbol in this pokie is the Treasure Chest. Landing 3 of these symbols is all it takes to transport you to the Free Spins Round. NetEnt has held up their reputation by producing absolutely stunning 3D graphics in this state-of-the-art pokie. The graphics have a childish, cartoon like feel but are executed with extreme precision and care. The imagery they have chosen to use rings true with the original children’s story and definitely feels authentic. One of the top reasons why players continue to flock to NetEnt games is because of their top notch graphics that are perfectly portrayed in this game. Sound is something that is often not given enough credit: it can make or break a game! In this case, it certainly makes it and it is recommended you keep the sound on for this one! There are the classic clinks and crescendos of your standard slot games, but layered behind it is music that has come straight out of a fairy tale! In order to win the not-so-elusive jackpot you’ll have to land 5 of the Jack symbols in a winning combination. The jackpot is 1000 coins, so the actual monetary value will depend on what coin level you are playing on. The higher you are betting, the bigger your win will be! Pokie Machines with bonus rounds are always just that extra bit appealing as they add additional excitement to the reels. And you’re in luck, because Netent’s Jack and the Beanstalk happens to have two special features, namely the Walking Wild and the Free Spins Round. Walking Wild – The Wild symbols in this game are definitely working in your favour! If they happen to land amongst the reels you’ll be assisted with a free spin. If you happen to win on this free spin the wilds will all stay in place but move one position over for your next spin, and this will carry on until you stop winning or until the wilds have exited the screen. Free Spins – Everybody loves Free Spins and the many shapes and forms they come in. 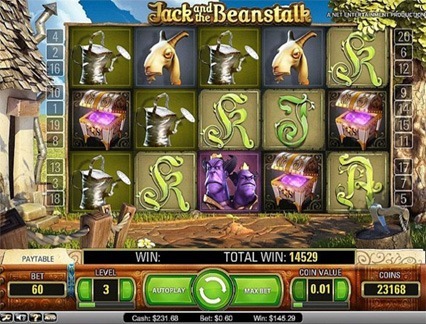 Jack and the Beanstalk’s Free Spins round is as thrilling as they get. In order to activate the Free Spins round you’ll need to land three or more of the Treasure Chest symbols anywhere on the reels. Once activated, you’ll be awarded with 10 Free Spins, as well as an additional 5 if you happen to land more Treasure Chests. 3 Keys – This will allow the next Wild that comes into play be transformed into a stack of two money bags. 6 Keys – The next Wild that appears will transform into 3 Golden Hens! 9 Keys – When the next Wild appears it will transform into an expanded Wild with a shifting golden harp, which gives you the opportunity to land bigger wins.